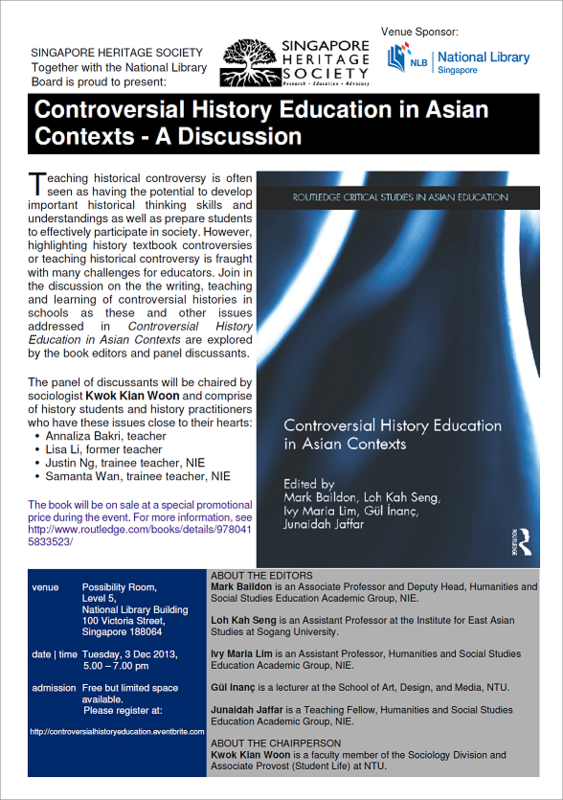 You are invited to a discussion on Controversial History Education in Asian Contexts, a newly published book by Routledge. The panel discussion will be chaired by Associate Provost (Student Life, NTU) Kwok Kian Woon. Date/Time: 3 Dec 2013, 5pm – 7pm. The event is open to all and admission is free, but due to limited space, please register at http://controversialhistoryeducation.eventbrite.com. Registration ends on 1 Dec 2013. Many thanks to the National Library for sponsoring the venue. More information on the event can be found in the poster attached here.